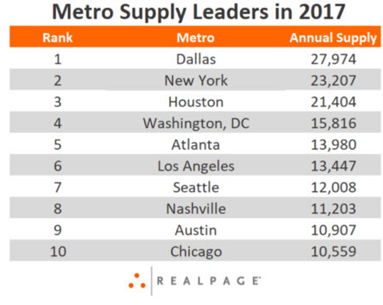 ​ ​DALLAS-FORT WORTH – Developers opened more new apartments in the DFW area than any metro area in the country during 2017. Almost 28,000 new rental units opened their doors in 2017, according to a new RealPage report. Nationwide apartment completions in the 150 largest markets totaled 395,775 units in 2017—46 percent more than in 2016 and double the long-term annual average. ​Check out Austin, DFW, Houston​, and San Antonio Multifamily Market Research.